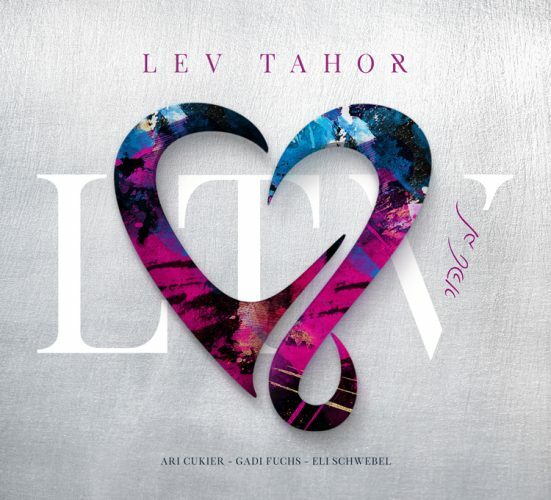 A lot of new albums are available for your Adar listening, but one album I would like to highlight is the new Lev Tahor album called LTV, or Lev Tahor 5. Lev Tahor is a group consisting of 3 incredibly talented members- Ari Cukier, Gadi Fuchs and Eli Schwebel. Eli Schwebel is the most recognized of the group, most probably due to his recent(ish) solo album titled Hearts Mind. However, Lev Tahor has put out 4 albums prior to this one so you may be familiar with them as well. If you are, then you know their style as nice and easy with a bunch of gorgeous slow songs and rocking, pumping fast songs. Lev Tahor’s first edition was a self titled Acapella experience that delved into the hits of Abie Rotenberg, Yeedle, and Avraham Fried. It was a massive sefira hit, and so they made a second album. However, this time, it was fully composed by Lev Tahor themselves (I believe mostly, if not all, composed by Gadi Fuchs). That album was released in 2002 and included hits suchs as Lev Tahor, Im Eshkochaich, Acheinu and Asher Bara. They then released their third studio album in 2004, another acapella one, which included hits from MBD, Chaim Dovid, Country Yossi, Abish Brodt, Carlebach and Abie Rotenberg. Finally, their 4th album, released in 2005, was again fully composed by the group themselves. This album included hits such as Im Lavan Garti, Ata Echod, Mi Bon, Chaveirim and Avinu, among others. It’s been 12 long years since and we’ve been waiting anxiously for this volume 5. This one promises to have a different feel as all 3 members say they have matured in their music mastery. LTV was produced and arranged by Eli Schwebel and Assaf Spector, and it’s apparent that this albums as this album’s arrangements sound similar to Eli’s solo album. The songs were mostly composed by Eli and Gadi , with a little help from a few others that will be mentioned as we go through them. The album is 46 minutes long and contains 12 songs. The jacket is gorgeous and was done by KrinskyDesign.com. They said they would give us both different and the same and they definitely achieved it. Enough with the introduction; Let’s get to the music! HALLELU- A pumping song that reminds me a bit of the Lion King’s Can’t Wait to Be King. It’s got a nice chorus and the kid’s choir that comes in at the midpoint is a nice touch. The vocals and choir really mix together nicely and obviously, the harmonies are spectacular, as expected from Lev Tahor. Composed by Eli Schwebel and Lindsey Buckingham, the lyrics sing right into the song and I really enjoyed this great song to start the album. LECHA DODI- This is one of my favorites so far. A gorgeous slow song with a really powerful low, and sweet flowing chorus. The music on this song is really nice and really fits the song perfectly. I don’t think I have to mention the amazing vocals and harmonies on every song, but they’re that good. This song was composed by Gadi Fuchs and really reminds me of the old Lev Tahor and is a great addition to their repertoire. GAM ZU LETOVA- This song was debuted at HASC 29 last year and was received very well there. It reminds me of Eli’s songs and I see he composed it , along with Elie Schwab, and Jay Stolar. The chorus is very catchy, I’ve found myself humming it around. I like this song a lot, and it’s lyrics and purpose is quite special and inspirational. SHOOVI- This is an interesting one. The music was written by Eli Schwebel, but the song comes from Tisha B’Av, and is used as one of the niggunim for the pizmon that R’ Schwab ZT”L made for the Kedoshim of the Holocaust. The english lyrics were written by Eli, Rachel Kahn, and Jay Stolar. This is a great song whether you use this niggun on Tisha B’Av. The music is really fantastic,vocals are superb and I love the mid/chorus. AVDECHA- This song has a robotic feel, with the techno and autotune. It’s a little haunting, to be honest, but I assume that’s the feel they were looking for. It reminds me of Eli’s stuff, and it was composed by both Gadi Fuchs and Eli Schwebel. I love how they use so many lyrics from Tehillim, it makes the album very special. SIMCHAS BEIS HASHOEVA (feat. LIPA)- This song is epic! Composed by Elie Schwab, it starts with a crazy convo between Lipa and some guy about a concert at the Beis Hamikdash with Lipa and Lev Tahor. The song fits both Lipa and Lev Tahor so well, and the go so well together, you can’t tell who the guest is. Such a cool and awesome song, and the music is so good. It ends sort of abruptly, but that must be the way they wanted to go out on such a crazy song. I definitely will buy a ticket to that concert, Lipa! BIRCHAS HACHODESH- Another gorgeous slow song composed by Gadi Fuchs (i’m not sure how he does it). It may be a little difficult to use on Shabbos in shul, however, it sounds great here. The harmonies and vocals are incredible and the music is simple and really nice. A real gem here and this album is just over half over! YAGGAPELLA- I loved this song on Eli’s album and I love it right now as well. With the rest of Lev Tahor adding in incredible harmonies, the song really does sound great. I thinkl they can even teach some “real acapella” artists a thing or two about keeping it simple and real, yet very fresh sounding. DROR YIKRA- I’m not certain I can call this sefardi sounding, but it definitely has some of that feel. This song was composed by Yehuda Gilden and is incredible. It features Rivie Schwebel, who definitely adds a ton to the song with his incredible harmonies and vocals. There’s a nice thump in the song and some guitar that really make the song pop. This could be the best version of Dror YIkra that I’ve heard and definitely one of my favorites on the album. MR. TANNER- This song is a whole story in itself. It talks about a cleaner that sang from his heart and enjoyed music but didn’t use it as livelihood, until he finally put up a debut, which he flopped at which point he went back to his cleaners and sang by himself again. Recently, the members of Lev Tahor themselves said that music for them is their life, but not their livelihood. I think this song is their motto and this sentiment is how they feel about their own singing careers. Honestly, this song is really cool with a great message that as long as you enjoy doing something, do it and don’t care about anyone else. A really good song composed by Harry Chapin. DON’T STOP GIVING- This song is a remix by Dilemmachine of Eli’s song Don’t stop giving and i believe the rest of the members also sing on this song. I like the song, it’s just a little too techno fro me, but I guess that’s how remixes go. It’s interesting that they decided to put this on, not sure why they did, but it’s good if you like remixes. MEHEIRA- I heard good things about this song and they were right. It is an excellent and can definitely be used at a chuppah. Love the arrangements on the song, very much like the other Meheiras out there. This one has that Lev Tahor high part with the long and high ending. Big fan of the song and great way to end the album. In conclusion, if you like, love or even slightly enjoy Lev Tahor’s music, this is a fresh, new and different album that has something for everyone. From thumping, awesome and pumped fast songs, to gorgeous and beautifully harmonized slow songs, to great english lyrics and awesome guest singers, this album is a must buy for any Jewish family. We waited but they definitely delivered an epic album. Hopefully the next one isn’t 10+ years away. You can buy it on mostlymusic.com or iTunes. I highly advise you add it to your collection.